Good forklift drivers are becoming harder to find in this tight labor market. They are in demand in many distribution and manufacturing cities, and willing to jump across the street for more money or better shifts. This is just reality in the age of e-commerce distribution. While you have to find ways to retain your best people, you also need to identify methods that can help make all your drivers better at this critical task. It’s more difficult to use the rack the higher up the load is because drivers can’t see the load or the rack beams as well — or sometimes not at all. They may not be able to tell if the tines are lined up correctly on the pallet when their forks enter it, and it’s very easy to bump or shift it. Falls are much more possible in that situation. On the other hand, when depositing the pallet, it’s not as easy to tell if it’s correctly positioned in the bay to rest both front and back on the beams, or centered correctly on decking. Remember that rack capacities are based on evenly-distributed loads, so it’s important that the pallets are square and centered. 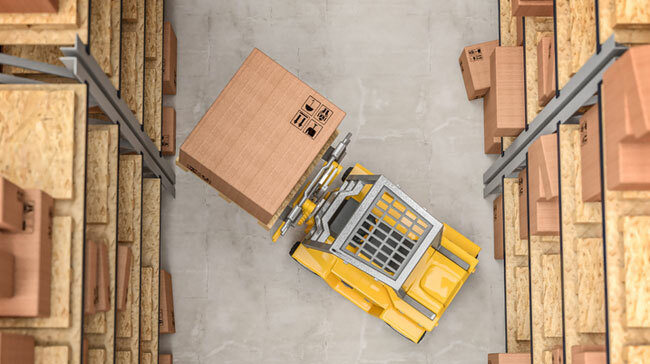 One easy way to reduce these risks is to make sure your racks are loaded with acceptable tolerances above and to the sides of each pallet load. 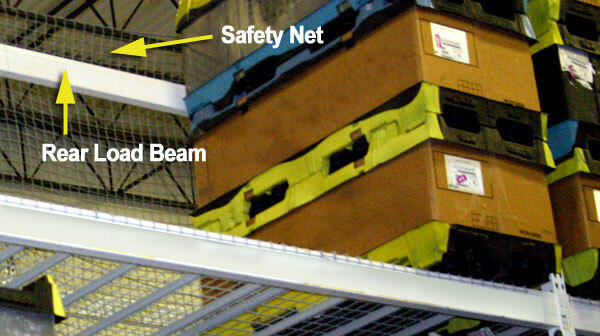 The recommended space is 4″ between the frames and pallets, and 10″ head clearance between the top of load and the bottom of the beam above it. If you don’t have adequate clearances, the forklift driver’s job is that much more difficult. For upper levels, this becomes more important, as drivers cannot see the load as well. If possible provide more space for upper levels. Forklift drivers usually receive training for safety because that’s OSHA-mandated. 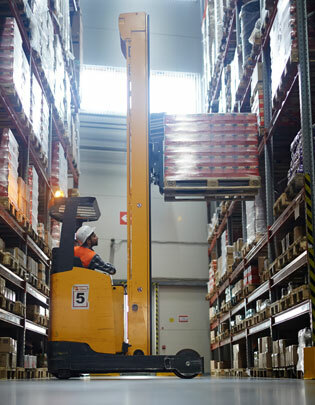 They receive training on how to drive and operate a particular forklift, which also must be done. But are they always trained on how to correctly load or unload the rack? If not, they should be, because that’s an area where both product damage and injuries can occur if they aren’t doing things by the book. Adding that type of training pays dividends if it stops just one pallet from falling, or a rack from being grazed and damaged. Making certain that drivers understand your expectations and process is a critical first step. Technology is really an enhancement to training. It does not prevent mis-loading on its own, but can help drivers see better, understand better, and work faster when deployed correctly. These options should be part of the training system, not outside it. Forklift blind spot cameras: These systems give drivers live video of where their forks are aimed. 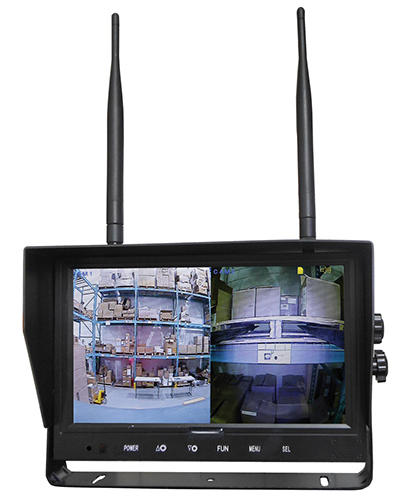 The wireless camera can be mounted on the back of the forklift as a back-up camera, on the overhead guard, or on the carriage so the driver can see where the forks are lining up with the pallet. When a load is high overhead, that visibility can really help drivers seat or select a pallet much easier than doing it by eye from the ground, through a roll cage. Laser tine guides: Another excellent visual indicator of where the forks are actually aimed that doesn’t rely on “eyeballing” it. These lasers are ideal for displaying exactly where the forks are, before trying to enter a pallet. Helps reduce the chances of tines breaking open bags, punching holes in cartons and damaging the goods — or a worst-case scenario of knocking off a large pallet or solid load. Tine leveling alarms: These alarms let drivers know if their forks aren’t level. That isn’t always easy to see when your pallet load is 25 feet overhead. They’re inexpensive, easily installed and effective at helping drivers understand when they need to correct their fork levels. This helps prevent incorrect pallet entry and transport, which are both important up high in a rack bay where the driver can’t effectively see his load. If training and technology fail, and a pallet is knocked off the rack, these safeguards that help stop carton or pallet drops are available. These all offer slightly different functionality and features and all are suitable for the right situation. Rack safety nets: These nets are typically installed on the back of a rack when it’s open to a traffic aisle. The idea is that flexible nets with high capacities can catch dislodged cartons or other loads before they fall into an area where they might hit someone or break. They come in a variety of sizes and capacities. They are highly recommended for any rack row that overlooks an area where warehouse workers are beneath. 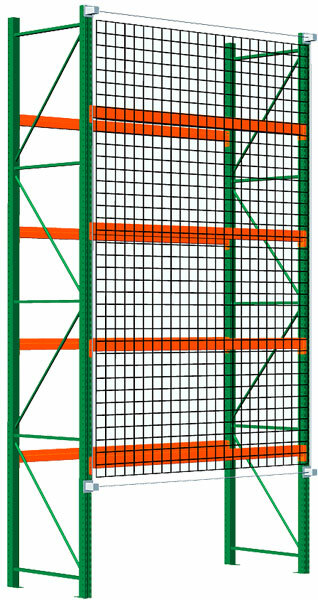 Wire rack backing panels: Like safety nets, these panels provide protection for pallet and load shifts. They are very strong, but do not flex like nets. They’re frequently used in high-density solutions like drive-in racks, but are also used for selective rack applications as well. You can compare nets vs. panels here to help understand the functional differences. Rear load beams & bars: These are simply pallet rack beams installed on the inside of each bay at the back, to help prevent pallets from pushing through and into either flue space or into a stored pallet in a double row. They are inexpensive, but do not provide protection for cartons or other partial loads that might fall from the pallet. Rack safety straps and panels: These straps are easily the most economical choice. They attach to uprights using teardrop connectors and are super fast and inexpensive to install. You can install just one per bay, or as many as you like to provide increasing levels of protection. They’re ideal for flue space maintenance. They can actually serve as a warning system by popping off if a pallet is pushed too far. Full panel versions can protect against falling cartons, but these aren’t designed to deal with a full pallets. Pallet rack collapses and major accidents are avoidable with the right set of training, resources and equipment. There are many ways to reduce these dangers in your facility and with the price of failure so high, it’s always worth exploring your options. Let us know if you have any questions on rack loading or methods to improve warehouse productivity and safety.